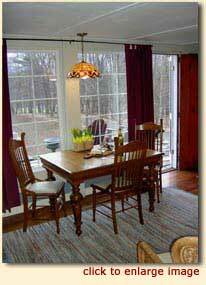 REDGATE LODGING is a renovated apartment in a 19th century barn on 40 acres in Shushan, NY, only thirty minutes from Bennington, Vermont and Saratoga Springs, NY. 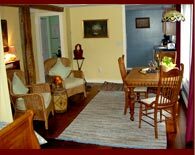 There is a full kitchen, sitting/eating area, queen bed in sleeping quarters with cable TV, a full bathroom with shower & bath and an outdoor porch with views of the Vermont Green Mountains. Amenities include coffee, teas, hot chocolates, soft drinks, fruits and flowers in season. REDGATE RATES are: $110.00 per night year round.Rates are based on doubleoccupancy and are subject to change without notice.New York State and local taxes not included. 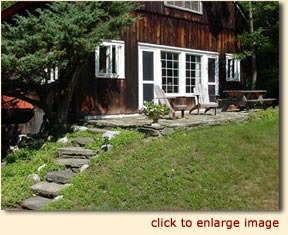 For a third person, add $30.00 per night. RESERVATIONS: A 50% deposit is required to confirm your reservation. Deposits may be paid by Visa, MasterCard, or personal checks. Credit cards are charged at the time the reservation is made. Personal checks must be received within one week of making your reservation or the reservation will be cancelled. Balance is payable upon departure. Visa/MC/debit cards/personal check/cash accepted. CANCELLATIONS: As a single unit property, cancellations affect us dramatically. If you wish to cancel all or part of your reservation we ask for a two week notice. Deposits, less $20 handling charge, will be refunded only if reservation is cancelled on time. With less than a two week notice, deposits cannot be refunded unless we can book the unit again. Extended stays may require that cancellations be made 30 days or more in advance to receive a refund.